im not talking about rene only... Orrn, sion, mundo, deal a lot of damage! then how come nobody banned her? if she was that broken she would be banned all the time, but truth is, only real akali mains would shine with her, she's not as simple as just point-to-click, she has a lot of tactics to her and thinking. : Ok, name another melee assassin that that much safe sustain. The issue was that Akali was an extremely safe champion and made her really frustrating to play against. : Honestly speaking, as a Katarina main I have never struggled against Akali while playing midlane. And I couldn't give a damn about how many skins you've purchased. Now if you think getting hit by a turret is a weakness then you're better off playing Pantheon. : Hello Akali players, please take my condolence from a player that lost 3 favourite champs in last 5 years to crappy remakes and Yasuo-mains. : Hi, Akali main here. Please don't revert. A lot of us in the Akali mains discord do not want her reverted. There's a loud group that wants a revert but, as a player of both old and new Akali, the previous version was an unhealthy stat check, and even though Akali right now is a bit of an annoyance to the balance team, her kit is a diamond in the rough. She can be balanced. in > Ain't the akali nerfs going a bit to far? : Ain't the akali nerfs going a bit to far? : Akali players - Stop crying. : While yes she has always had a heal that doesn’t mean she should continue... the game evolves and with it so do champions, the heal on akali is no longer healthy (due to her safety being improved, having gone from 3 targeted dashes post 6 to 3 free cast dashes, ones being before 6), therefore it got removed It’s not a big part of her kit, and with the game evolving to the point where it’s an issue it needed to be removed. yet you guys ignore the facts : lowest win rate. her scaling is terrible, if she doesnt win by mid game, she's total trash, her late game is so weak. it's so easy to look from the side and say - oh look, she has 4 dashes... well first of all, her ult has a super long cd, so that's 2 dashes in about 2 min cd, and her e is so hard to hit, due to it being real slow as well... Ofc she's a skill based champ now, and great players might look good with her, but this nerf is irrational and has no sense. all this to lower her ban rate while her win rate suffers even greatly. So good job guys, all of you who cried about playing against her - you got your wish, riot listened. but all akali players suffered greatly from this and have to main another champ now. A small revert to her old self will make all happy, fix everything, but no, rito has too much pride. she was never a "safe" pick, even before her remake, and she always had healing until now, that's part of who she is. like it or not, maybe u hate playing against her, ofc she is annoying, but so are like half of the champs. and she was never an easy champ to master, even her old self, you could die really easily in tf, and her laning phase was really weak pre-6. so yea, if u dont play akali its easy for you to say all these stuff, but what if it were your main champ who got guttered like that? : Try to restore default setting in NVIDIA Control Panel NVIDIA Control Panel > Manage 3D Settings > and Restore defaults. you can also try to change the FXAA setting to off. 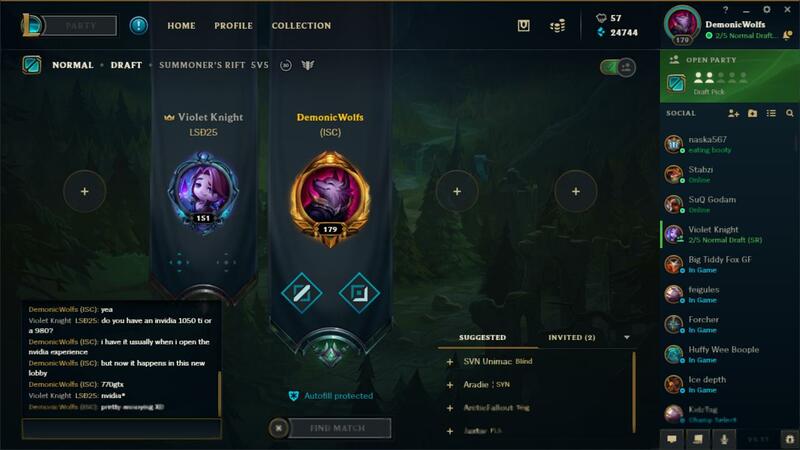 : Some more info would be nice like for example 1:Does it happen every time and in the same spots on the client itself? 2:If you move the client do the spots move with it or stay in the same place on the screen ? 3:Does it happen ONLY with LoL client ? 4:Did you try updating the drivers? 5:Are they really "spots" or like a bar spanning all of the bottom of the client window ? And Riot support answers within 48 hours so you can wait for them. Tarolock, I had much worst games than this with lulu and got atleast A+ for this kda, there was no issue with warding and ward destroying, just did it as i usually do, same with shielding and assisting... I never got this grade unless i lost a game (with lulu) and I know riot was messing around with grading system for support, to make it better.... as it says in patch notes: "SWIPER NO SWIPING: Support grades specifically weigh assists equal to kills, leaving one fewer excuse for bloodthirsty Flash-Ignites"
Why is there still no official game recorder from RIOT? wasn't that at the same time her ult proc'ed? You are lucky, i was g2, started s1 this season, was in promotion to gold, won 2 out of 5, now i'm in silv 2 :D i've been struggling a whole season to get to gold, now i feel like i need to do it all over again..
: How it feels to play against Annie. in > How it feels to play against Annie.